The 2001 NHL Challenge logo is a trademark of the National Hockey League, © NHL 2017. The logo is being used with permission, and is courtesy of the NHL. The Colorado Avalanche was one of four teams that took part in a mostly forgotten event named the NHL Challenge, in which NHL teams traveled to Europe for their training camps and played a few pre-season games against local European teams. The Vancouver Canucks played two games in Stockholm, Sweden in 2000; the Toronto Maple Leafs played one game in Helsinki, Finland and two games in Sweden’s capital in 2003; and most recently, the Boston Bruins played one game in Belfast, Northern Ireland in 2010 (against an all-star team of the British ice hockey league) . That’s six games in total. Don’t worry, I didn’t forget about the Avalanche. 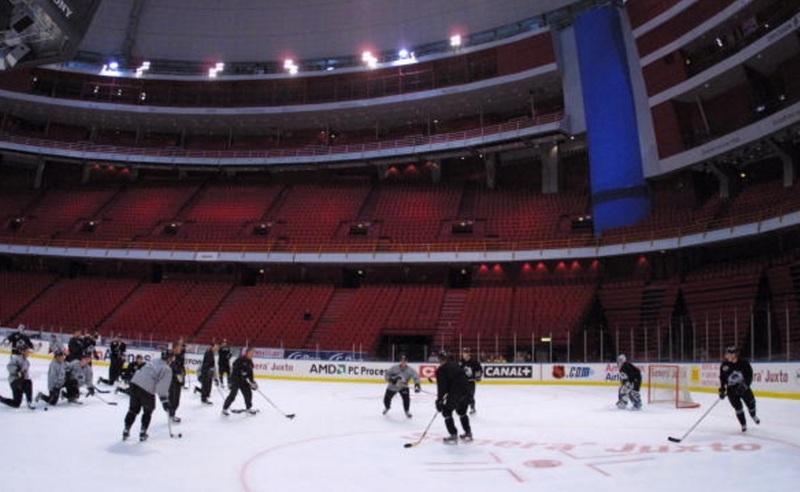 The star-studded roster of the reigning Stanley Cup champion flew to Sweden for their 2001 pre-season camp. It’s not all too surprising that the Avs were extremely popular in the entire hockey world back in those days. It was supposed to be an unforgettable experience, with local Swedish fans having the unique opportunity to experience hockey heaven. Nobody could predict that this event would end up being an absolute disaster. First of all, the Avs were also scheduled to travel to Finland. Actually, there were many other things that were supposed to happen. The 2001 Stanley Cup Champions arrived to Sweden a few hours prior to 9/11, a horrific event that shocked entire world. Suddenly, the entire team, staff members, NHL executives, North American journalists and other members of the crew were stuck at the other side of the planet, far away from their homes and families. They could only watch news on the TV and repeatedly tried, sometimes unsuccessfully, to call their friends and relatives in an era when fast internet access and a reliable international telephone network weren’t the standard. Two scouts of the Los Angeles Kings, including their head scout, were among the 9/11 victims – and they both were friends of some of the 2001 NHL Challenge participants. The entire crew couldn’t leave Europe. The US airspace was closed for all flights. It took a number of days before the team was allowed to take off – thanks to behind-the-scenes efforts made by Avalanche owner Stan Kroenke who also made the trip with his team. He even welcomed all of the event’s participants on a flight back to the US (e.g. journalists flew to Europe separately). Former long-time Denver Post beat writer and, since summer 2017, BSNDenver.com writer Adrian Dater wrote his own account of the 2001 NHL Challenge in his two books about the Avalanche - Blood Feud and 100 Things Avalanche Fans Should Know & Do Before They Die. Thanks to Dater, fans came to know that the Avs were the first major North American sports team to play a game following 9/11. It was their only game at the event - a 5-3 win against Brynas IF in the very same arena where they will play in November 2017. Moreover, Dater shared his memories of how players, the team’s GM, its owner and other people reacted after they heard about the 9/11 attacks for the first time. He also described the shocking announcement made by Peter Forsberg about taking a year off, officially due to his ankle problems. A terrorist attack and the loss of arguably the best player at the time – the 2001 NHL Challenge likely isn’t something Avalanche executives and former players remember fondly. The Eurolanche Fan Club spoke with Adrian Dater; the former Rocky Mountain News beat writer, current NHL.com and Hockeybuzz.com correspondent Rick Sadowski, former Avalanche player Vaclav Nedorost, who played in the aforementioned game in Sweden and two long-time Avalanche fans from Sweden Fredrik Nilsson and Simon Soltan-Zadeh. All were witnesses of the Avalanche’s only visit to Europe so far. We tried to focus on topics and details that have never been published before – or were printed somewhere, but have ultimately disappeared in media archives. It was extremely hard to find anything about the 2001 NHL Challenge online. Websites of both North American and European media weren’t on the level they are currently on. Even if some websites published anything about the event, all have since upgraded their respective websites, meaning that those old published stories are gone. I spent a few hours on Google and used Archive.org to find anything about the forgotten event, but the service is limited and didn’t show all pages from all dates in the past. The same happened with the official schedule, Avalanche roster and even with the dates of the scheduled games. Fun fact – even the 2001-02 Colorado Avalanche Media Guide contained next to nothing about this event. There are only two dates for two games in the season schedule. For some reason, the third and the only actual game the Avs had played is missing. The archived version of the official website of the Avalanche contained nothing in its news section from the time when the team was in Europe. Wikipedia has the wrong date of the game. Brynas representatives didn’t respond to my requests if they have any record of this game. The good people at the NHL office promised me to look into their archives, but said that I shouldn’t expect much (if they’ll find anything, I will update this story). There are almost no official photos from the event and said game besides Getty Images photos. Neither hockey historians, nor game sheets collectors had anything about the Avalanche’s only appearance in Europe. I began to ask myself if the entire event did even happen… Of course it did. I hope this story will fill the hole in Avalanche/NHL history and will provide a good source for hockey fans who couldn’t find more information about the event. The following article is Eurolanche’s tribute to the 2017 NHL Global Series, which will see the Colorado Avalanche play two games against the Ottawa Senators in the Ericsson Globe arena, Stockholm, Sweden on November 10 and 11, 2017. The Avalanche will come back to Europe after 16 years and the aforementioned couple of games will be their first regular season games on European soil. The Eurolanche Fan Club will attend both games and will also spend five days in Stockholm as part of the Eurolanche Raid 2017, which will feature 52 Fan Club members from 10 different countries and two continents. Dozens of Eurolanche members will travel to Sweden individually. This website, GlobalSeries.Eurolanche.com, will serve to pay tribute to this historical event for all Avalanche fans living in Europe. It wasn’t common to see NHL teams in Europe at the beginning of the 21st century – not that it has been common at any time before. Yes, there were a few occasions, but it happened for the first time when the defending Stanley Cup Champion flew over half of the planet to Europe in 2001. Colorado was ready to make history. 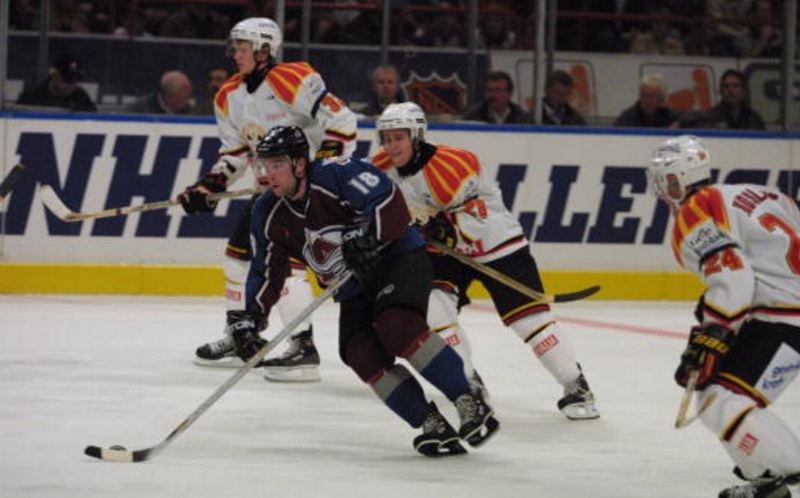 The NHL announced the 2001 NHL Challenge, as well as the Avalanche as the team taking part in it, on January 25, 2001. "We look forward to having an NHL team compete outside of North America again. By returning to Sweden this year, and also traveling to Finland, we´ll expose more fans from around the world to NHL action," said NHL Executive Vice President and Chief Legal Officer Bill Daly that day. The official NHL website reported that both NHL and NHLPA executives along with Avalanche general manager Pierre Lacroix visited Stockholm and Helsinki to make this announcement. I am not sure if they really visited both capitals in one day, but anyway it shows how much this event meant to the hockey world, especially when you compare it with today´s press-release announcements. If you’d ask me for photo proof of the team’s visit to Europe, I am sorry – they don’t exist on the internet. "We´re honored and excited to be the organization representing the entire NHL in Stockholm and Helsinki during our upcoming training camp. The entire experience should be something fun and challenging for our players and an excellent opportunity to promote this great game of ours overseas," said Colorado Avalanche President and General Manager Pierre Lacroix at the press conference. It was such a surreal moment for long-time Avalanche/Nordiques fans, who’ve had a hard time to even watch their beloved organization on TV. “I remember one day opening the [daily newspaper] Aftonbladet, going to the sports section and reading the headline - Foppa is coming to Sweden! At first I thought ‘WHAT?? ?’ Peter Forsberg is returning to play for his hometown team of MoDo immediately after winning his second Cup? But I quickly realized that no, this was something way better! He would come to Sweden with the Avs for training camp!,“ recalled Fredrik Nilsson from Virserum, a long-time Avalanche fan, who only missed 3 or 4 Avalanche games on TV/internet since 2005 in our email interview. Yes, the NHL made an announcement in January ’01, but Fredrik found out months later. It wasn’t just the fans who looked forward to the event. “(I felt) Excitement, and hoping that my paper at the time - the Rocky Mountain News - would want me to make the trip and cover camp. It was my first trip to Europe,” remembered Rick Sadowski. His colleague from his then-rival newspaper Adrian Dater - who made his European debut, too - just confirmed his words. “I was very excited. The Avs had just won the Stanley Cup four months before, so obviously everyone was excited to see how the team would look coming back. Everybody was just very, very excited by the whole thing, especially us media people,” said Adrian in an interview for Eurolanche.com. According to NHL.com’s initial story about the event, the 2001 NHL Challenge was scheduled to start on September 11, 2001. We know the team departed from Denver on Sunday, September 9 and arrived in Sweden in the morning on the next day. The players took the ice for the first time on September 10, only four hours after they got off the plane. The Avs were supposed to play two games in Sweden against Djurgarden and Brynas as part of the NHL Challenge-Stockholm and one game in Helsinki, Finland against Jokerit as part of the NHL Challenge-Helsinki. Their second Swedish opponent was announced at a later date following the event’s announcement in January. The Avalanche were having two separate training camps back in Denver (36 players) and in Hershey, PA (15 players), where their then-AHL affiliate was located. It was the first and also the last time the Avs held two camps. Only Peter Budaj from the smaller camp made it to the NHL and played for a longer period of time. With many players on the training camp roster, it was clear not everyone could join the team for its overseas trip. The staff had to pick their best available players and top prospects. They built a 25-player roster – and, as you could guess, it wasn´t without complications, which made my search even harder. Originally, Bryan Muir – who joined Avs in 2001 and left in 2003 after 62 games, in which he recorded 4 points – was supposed to travel too. His plans changed only hours prior to the flight to Europe, when he had to undergo an appendectomy. There was not much time to choose a replacement, so my guess is that the coaches called the next available player. They could pick anyone from their recent rookie camp held in Denver. They called Russian defenseman and their 6th round pick in the 1998 NHL Entry Draft, Alexander Ryazantsev. From the roster traveling to Europe, only him, goalie Philippe Sauve and Czech forward Vaclav Nedorost had zero NHL experience at the time. Nedorost appeared in 67 games for the Avs and recorded 13 points. He was traded to the Florida Panthers in 2003 and after one season, he opted to return to Europe where he’s been playing ever since (mainly in the Czech leagues and the KHL). His NHL career only lasted for three seasons due to several injuries. “I had 8-10 injuries in my first two years in Colorado and three of them were serious. The team doctors were skeptical about my future and they were right,” said Nedorost to Eurolanche. Later, he even missed one full year due to health problems. There were two groups that were going to watch the first Avalanche games in Europe. The first group consisted of the team itself and the entire crew that was on the list for a new adventure – from Avalanche PR employees, through NHL executives, to Dater and Sadowski - whom both were allowed to take their wives - but had to pay for all their expenses. This group had to prepare for a long trip to the so-called “Old continent”. It was supposed to be a nice start of the new season for the defending champs. The second group consisted of local Avalanche fans. Traveling through Europe wasn’t as easy at the turn of the century as it is now. Not many Europeans – especially those from Central and Eastern Europe where many, many, and I really mean many Avs fans lived – could afford a trip to Sweden. That’s the reason why the majority of the supporters hailed from Sweden. But they needed to get their tickets first. “Back then, buying tickets online was not as easy as it is today, so to be sure you’d get tickets, you had to call the ticket seller and hope for the best,” said Nilsson. “After waiting in line for at least an hour, maybe more, I finally got connected just to find out the two first games were sold out. The only game I could get tickets to was the game against Brynas. You can imagine my disappointment, and the feeling of ‘Oh I’m so unlucky!’,” said Nilsson who was very lucky in the end, as he got a ticket for the only game the Avs ever played in Europe so far. The Avalanche fan base in Europe was happy their beloved team was coming to their continent - and that they didn’t have to travel to Denver. Not many Avs fan could see their favorite team in person in their first years of existence after the team’s relocation to Colorado. We already published a fan story of Roger Rensch from Switzerland, who was the president of the now-defunct fan club of David Aebischer and he organized overseas trips between 1998 and 2008 to Hershey, Denver and other cities where Abby played. But he was really one of a few lucky ones, so you can bet the big majority of fans were praying for the end of the summer of 2001. As I already mentioned and I will also mention later, the 9/11 attacks had an enormous impact on the whole event. But take a look at the first hours of the Avalanche’s camp, when everybody was enjoying a unique start of the season. “The first two days were fine. We mostly did just sightseeing on that Sunday, going downtown to Stockholm for dinner. I went with my wife to some old restaurant. In the elevator on the way back to our rooms at the hotel, Eric Lacroix was in it too. We asked him where he went and what he had and he said he had something called ‘sweetbread’. My wife told him what that was - cow brains, and he started looking sick. Our room was tiny, so we did a lot of hanging out around the hotel and in the lobby restaurants and stuff,” recalled Dater. As Sadowski said, one of the main team activities during the first two days aside from team practice was supposed to be visit to the US Embassy in Stockholm on September 11, which was later canceled for obvious reasons. Nobody had a clue what would happen in the next couple of hours following the Avalanche’s arrival to Europe. Fans were enjoying their presence in town. They were waiting on the players outside their hotel and reading local media stories - not only the supporters, but the journalists themselves were hungry for everything regarding “Peter the Great”. Actually, both Dater and Sadowski independently said they believe Forsberg’s popularity was a major reason why both the NHL and the Avs decided to go to Europe. Simon Soltan-Zadeh from Stockholm shared a nice memory of the meeting with his big hockey idol with us. 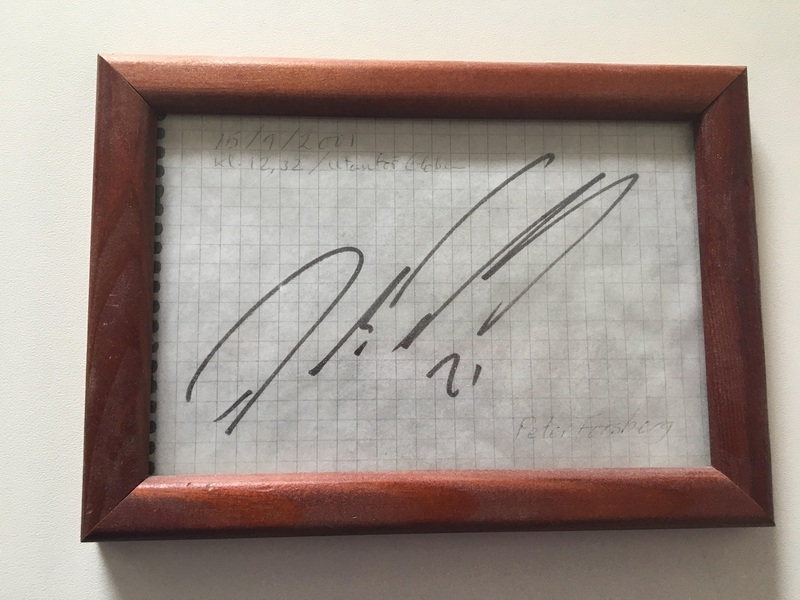 “I went with my father towards the Globe Arena and the team hotel in search of autographs and can you believe it, just as the taxi arrived, I saw Peter Forsberg about 100 meters away. I told my father with a broken voice that Forsberg was standing there and he immediately told me to run up to him. I was paralyzed for a few seconds before stumbling out of the taxi and making my way towards him. It was only 4 or 5 other people around him and he was already writing autographs. He was just about to leave when I managed to hold my paper and pen forward and squeeze out a weak ‘Peter..’.. Fortunately he heard me, signed the paper (pictured below - editor´s note) and then turned around and walked away,” said Soltan-Zadeh remembering the story after 16 years. He later found out Peter was actually going to the press conference, at which he announced his full-season break from hockey, about which we’ll speak more later. Shjon Podein: "It´s just a sick feeling in your stomach. Our thoughts and prayers are with the people back home. There´s been a lot of just sitting up and watching TV, waiting to hear or see if we can get some good news out of this whole thing. That doesn´t seem to be happening too often. This is something you deal with day by day, hour by hour." Rob Blake: "It´s just really unfortunate. From the time it happened, (news) spread quickly around the hotel. You call home and make sure everything is all right there, and you go from there." Peter Forsberg: "It was a long day (Tuesday). It´s unbelievable that it happened. It´s just a tragedy. We´re far away from it here in Sweden, but I think everybody´s just shocked. Hopefully, they can find out who it was." Coach Bob Hartley: "Everyone is in mourning here. It´s real tough on everyone here, but I thought our players showed lots of professionalism today. They showed up in good spirits, and that´s good to see." Alex Tanguay after the arrival back in Denver: "We don´t know what´s going to happen. If there was to be a war or something like that, everybody wants to be with their loved ones." For the next couple of hours, nobody knew what would happen with the ongoing NHL event on the other side of the globe. Several NHL executives even believed their event would continue according their plan. Nothing can beat sport. But the situation and circumstances were very different. At the end of the day, it looked like the whole event might be canceled. Fortunately for many European fans, that never happened. Despite the horrific events, the NHL and the Avs decided to play one game as part of their own event - and made many local ice hockey fans happy. Still, there were five days between 9/11 and the game itself. I guess you didn’t need to be there to realize what the next days were about. Thinking about life in general. More and more calls with your family and friends, who were suddenly so far away from you. Waiting and waiting for more news. Practicing to pass the time… Hockey suddenly didn’t matter as much. I don’t know about you, our readers, but the lines above make me sick - and I am only a reader just like you. Back in 2001, I was eleven, I hadn’t much knowledge about the Avalanche or politics in general, but I still can remember exactly what I was doing in that second when I heard about the 9/11 attacks for the first. This further underlines the entire impact and significance of these tragic events – when a child from a small European state that wasn’t directly affected by the attacks remember such details. I can’t imagine how big of an impact the events had on the immediate witnesses, their families, friends and the entire US. Life in Sweden had to go on. It wouldn’t do any good to anyone to be locked in their rooms and wait. Both Dater and Sadowski continued their media coverage. They wrote more pieces about the current atmosphere in the team and the thoughts of the players. In the paragraph above, I wrote that I can still remember “my” 9/11 and so do Dater and Sadowski. Sadowski still remembers the Swedish locals who were expressed their sympathies to him, Dater and their wives. “The Swedish people were just wonderful. 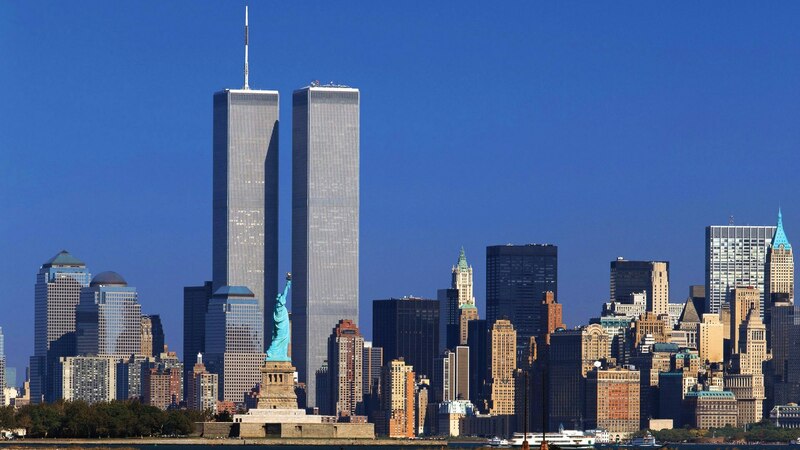 I remember seeing a black-and-white photo of the New York skyline and Twin Towers in a store window. A rose had been placed with it. The local people would ask if we were Americans, and would say how sorry they were for what happened,” recalled Sadowski. Everyone from the crew was trying to do his work during the following days. Players were practicing. Coaches were coaching. Journalists were writing. Some sources say that an open practice was scheduled to take place in Stockholm (I didn´t find it in the official plans), but was later canceled for the public. We know that an open practice was planned in Helsinki, but the trip itself never happened. Four days after 9/11, the world of the Colorado Avalanche was hit by its own little tragedy. First, Forsberg called his agent, then his father and finally, Pierre Lacroix on the evening of September 14 to announce his temporary retirement from hockey. As the Denver Post reported, Lacroix was so shocked he couldn´t do anything in the next hours and called Forsberg back on the next morning. He then set up a meeting with Foppa and Stan Kroenke. “(The organization is) shocked at the decision, but we have to live with it. I know his feeling went deep. He told me he did not have the desire, strength and mental toughness to compete right now,” said Lacroix. The word “shock” had been used by everyone following 9/11. Now, after Forsberg´s decision, it was used even more frequently. I read some quotes made by Avs players and they are almost identical - “We are shocked” - was their most frequent statement to the media. They were shocked, because nobody could see any indication that Peter the Great may leave the team just like that. Ville Nieminen openly said Peter looked great on the ice at recent practices. Dater met Forsberg in Stockholm in an elevator on September 10 when the team flew in. They had a brief chat and the Swedish superstar made no indications that something was wrong. Sadowski called his decision „another shocker“. Fredrik Nilsson recalled the fans believed Forsberg was going to hold a normal press conference on the occasion of the event in Europe about his career and recent success in the NHL. No. Forsberg made the decision to take a break from hockey. “I just feel that right now, in my current frame of mind, I can´t go out and play at the level I expect out of myself. Over the last few years, the numerous injuries and the recent surgeries made me come to this decision,” said Forsberg at the press conference on September 15. 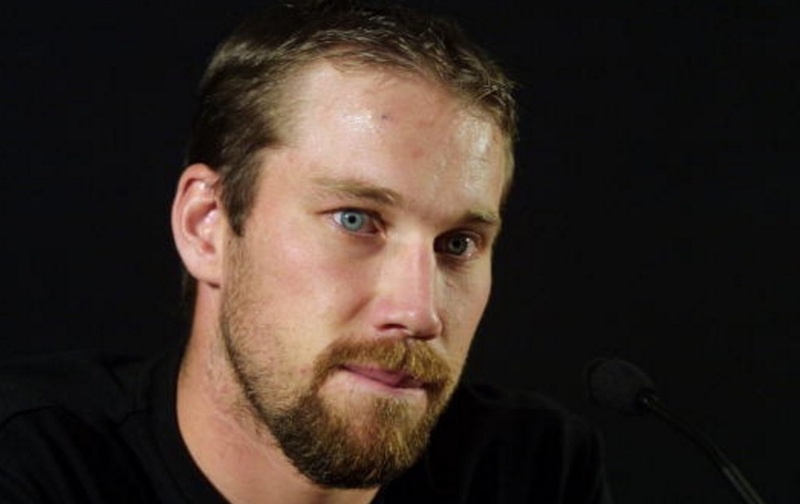 Forsberg’s announcement was the first major NHL news story after 9/11. After the conference, Forsberg had left the team and didn’t even appear in the stands the next day, when the only 2001 NHL Challenge game was played. “It was another total shock, right out of the blue. I remember the Avs put out a press release. That´s how we all found out. I simply couldn´t believe it when I read it. I knew I had a hell of a lot of new work to do that day, and it was crazy,” said Dater. There was a big level of uncertainty surrounding Forsberg’s sudden or maybe well-prepared decision. Nilsson knew Forsberg’s health wasn’t 100%. He had surgery after the Western Conference Semifinals series against the LA Kings and missed the following two series, including the Finals. “Back then, we didn’t know if it was the end of his career or not,” said Nilson, who was still looking forward to seeing his Avs in person despite Foppa’s absence. I started to follow the Colorado Avalanche in 2000 when I was 10. There was no internet, no NHL on TV, no NHL highlights on TV, no NHL media except a monthly magazine, nothing. I watched my first Avs game three years later. My only source for news was the aforementioned magazine and teletext. Kids, do you even know what that is? In the years that followed, I’ve been absorbing everything related the Avs from all possible sources. The Eurolanche Fan Club and Eurolanche Invasions to Denver gave me the unique chance to go behind the scenes and to experience things other fans may never get to experience. But still, I didn’t know about a part of Avalanche history for many years. I had no idea they played one game in Europe in 2001. I read about it for the first time around 2008 in Dater´s book Blood Feud. As I wrote at the beginning of this story, there were – and still are – no other relevant sources for the event and this single game. There’s such a lack of information that the majority of sources, including Wikipedia, state that this game was played on September 17. I can confirm that it was played on the day before that, on September 16. 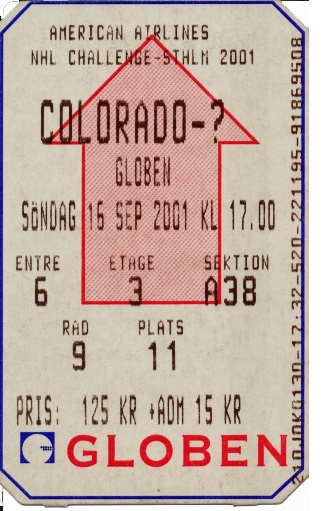 There are different opinions on the sole Avalanche game in Sweden in September 2001. Some believe it was the decision of the players to play as there was nothing to do and because it was better than just sitting in their rooms and waiting on approval to fly back to the US. Other people think nobody wanted to play and that the game itself lacked passion. All in all, it doesn’t really matter. At least not for Europeans who were in the stands, as it was the first chance to see their favorite team in person. 99% of them have never seen the Avs play live ever again. Luckily, this will change for many in November 2017. The Avalanche roster was without their three biggest stars. Foote had been injured the whole time. Forsberg was already gone. Sakic pulled his groin and his absence from the game was announced during warmups. As you remember, the original roster for this trip consisted of 25 players. Subtract three and you have 22 – and 20 of them appeared played against Brynas. Only rookie goalie Philippe Sauve and veteran defenseman Darryl Shannon were healthy scratches. By the way, Shannon announced his retirement from hockey after the 2000-01 season, but changed his mind and went to the Avs camp on a try-out basis. He was ultimately released by the team one week after the game in Sweden. I have no idea if he even played in a pre-season game for the Avs. Moreover, fans in the Globe Arena could witness Avs prospect Alexander Ryazantsev in one of his few appearances in an Avalanche sweater. He never played a regular season game for the Avs and only appeared in pre-season games. I guess he played the role of the 7th defenseman against Brynas and didn’t play a lot of minutes. But the whole game was serious for 13 602 spectators in the Globe Arena. Fredrik Nilsson was one of them. After a minute of silence and both the Swedish and American anthems, the game started on September 16, 2001 at 5 pm local time (9 am MT). “The Avs looked really uninspired at first and Brynas took charge, scoring two goals on their first 3-4 shots or something like that. Roy, the future Hall-of-Famer looked terrible and I started to wonder if the Avalanche were really going to lose to a mediocre Swedish team,” said Nilsson. It didn’t happen. Despite being down 0-2 with 12 minutes left in regulation and 1-3 with 9 minutes left, the Avs managed to pull off a 5-3 win. Alex Tanguay scored the first goal, assisted on Milan Hejduk’s next goal and scored another one to tie the game. Stephane Yelle scored the game-winning goal and Tanguay completed the hattrick with an empty-netter. Patrick Roy was in the net until midway in the second period before being replaced by David Aebischer – who didn’t concede a goal and could add the game into his official stats as the game-winning goal was scored while he was on the ice. "They really played unbelievable," Tanguay said after the game that was played on a European-sized rink, but with NHL rules and NHL officials. "We didn´t know anything about them. But they played outstanding and they caught us off-guard in the first. I don´t think we were ready for them. They can move the puck. It was a lot of fun with the bigger ice surface. We´re not used to that." After many years, neither Dater nor Sadowski remember the details of the game. There’s no wonder when you consider the circumstances they were in. “Couldn´t have been happier,” Sadowski described his reaction to being told by the Avs PR employee that the entire crew would leave Europe immediately after the game. It was the owner Stan Kroenke who managed to find a charter company that takes athletes and teams to their events. As Sadowski said, this particular company had flown PGA golfers from the USA to London. Kroenke successfully rented the plane. It’s important to note that the entire group flew to Europe via a commercial flight for the first and probably the last time, because American Airlines were one of the main sponsors of the event. With the US being under attack, it was impossible to get a return flight from AA as soon as possible. Dater remembered his meeting with Stan Kroenke during the second period when it was clear everyone would go home soon. “I took a walk around the concourse between periods I think, and I saw Kroenke in his suite. I stuck my head in and said ‘Hi’, and he invited me in. He was wearing his trademark, at that time, dark blue pinstripe suit and he had a glass of red wine in his hand. I think we mostly just talked about the craziness of the week, and our shock, etc. I don´t think [after 9/11] he had any idea just yet what the travel plans would be in the following day or two, but I believe he was working on it. He was very nice. I’ve always said he´s been a gentleman to deal with, and that time was no different. It wasn´t until a couple days later that we were told we´d gotten the go-ahead to fly back on a chartered plane, and that included everybody - media, NHL staff, players, family, everyone. It was a big 757 jet, so there were a couple hundred seats,” said Dater. “Complete joy! We all loved Stockholm and would love to return, but couldn´t be happier at that moment to be home,” said Sadowski. The team was finally home, but they’d left an important piece of the winning machine back in Sweden. Peter the Great. His temporary retirement announcement was a shock for everyone, but it was an even bigger shock when he flew back to Denver right in time for the 2002 Stanley Cup Playoffs and finished with the most postseason points – 27 points in 20 games – despite not getting to play in the Finals following the team’s Western Conference Finals loss to the Detroit Red Wings. The Avalanche wouldn’t return to Europe for 16 years. We, Europeans, had to wait many, many, many years. In total, 1,376 pre-season, regular season and playoff games had to be played by the Avalanche before the team came over again. I was fortunate to see them for the first time in 2008 during Eurolanche Invasion I and to see them 51 more times during my next seven overseas trips to the US. They will play only two games in Stockholm, but these two games will mean a lot to everyone in Europe. And for me as well. I still wish to see the Avs play in my hometown of Bratislava, Slovakia, though, but I am completely OK with seeing them play anywhere else on my continent. The Eurolanche Fan Club celebrated its 10th anniversary during the 2016-17 season. We couldn’t have wished for a better birthday present. I wonder if Eurolanche – which is unrivaled among other fan clubs in the entire NHL – contributed to the NHL/Avalanche decision to come back to Europe. Honestly, their current results couldn’t be the real reason. We’ll probably never get an answer to this question, but I believe we have been one of the deciding factors. We believe our 10-year voluntary work, nine organized Eurolanche Invasions and many other events got the Avalanche over here. This long-form story was published on July 24, 2017.